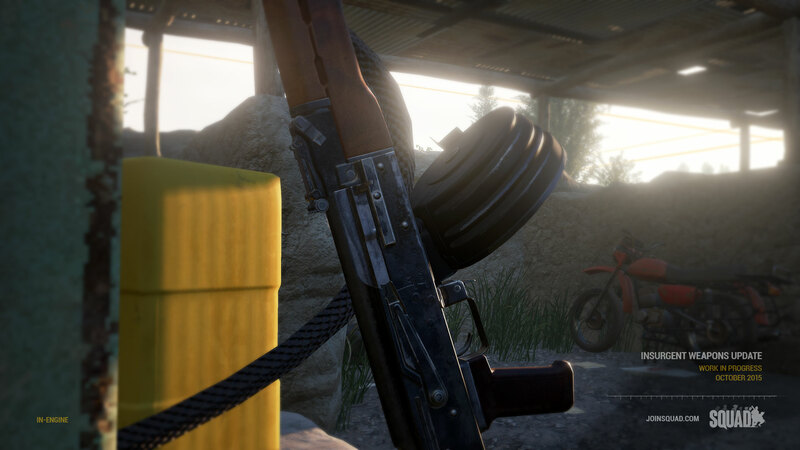 Version 2 Announcement : Squad – Communicate. Coordinate. Conquer. It’s Offworld, bringing to you a frightfully packed update on the next Closed Alpha build (Version 2), set to come out at the end of the week, Thursday 11pm PST/Friday 6AM GMT. We’ve been hard at work not only adding in new features, game modes and weapons, but also making the current experience smoother and much more enjoyable. All the good stuff! The Closed Alpha version 2 will be available through the Alpha portal for download to all Founders. Below is a massive changelog of all the things that have been going down this month and have made it to release! The Project Reality classic is back! 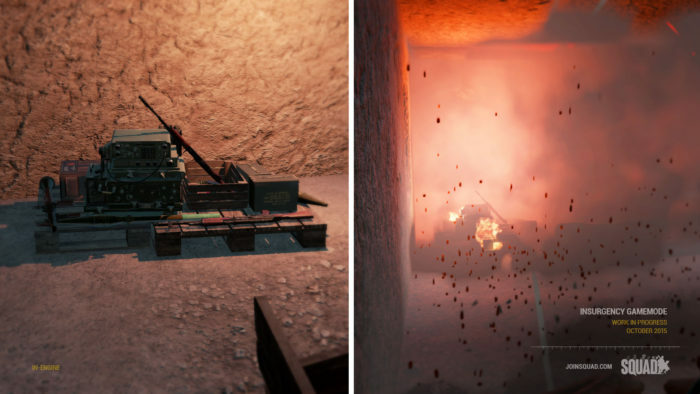 Two Insurgent Weapons Caches spawn at the start of each round. The US Army forces must take out insurgents to gain Intelligence and get hints to where the caches are located. As each Cache is overrun and destroyed, another one spawns in a random location on the map. US Army Squad Leaders have an Incendiary grenade to destroy the Caches, the US team needs to destroy a total of 5 Caches to win. The Insurgents must drain the US Army team’s tickets or wait out the clock to win. A New Gamemode focusing on pure defence & offence depending on the side. Insurgents have a number of territories at the start that they have to defend. The points are not meant to be captured in any particular order. If the US capture a territory, it cannot be recaptured. US has a time limit to capture all the territories. Some territories have a spawn point that can be captured. All the scopes have been redone, improving their sight picture and alignment. 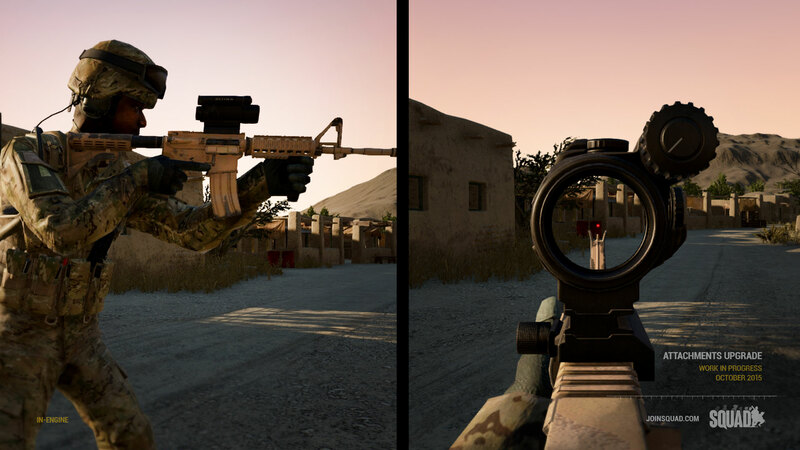 New attachment system allows us to attach several accessories and optics at the same time. Some variants of the M4 now have a foregrip. ACOG reticle is now fully usable with ranging and bullet drop. 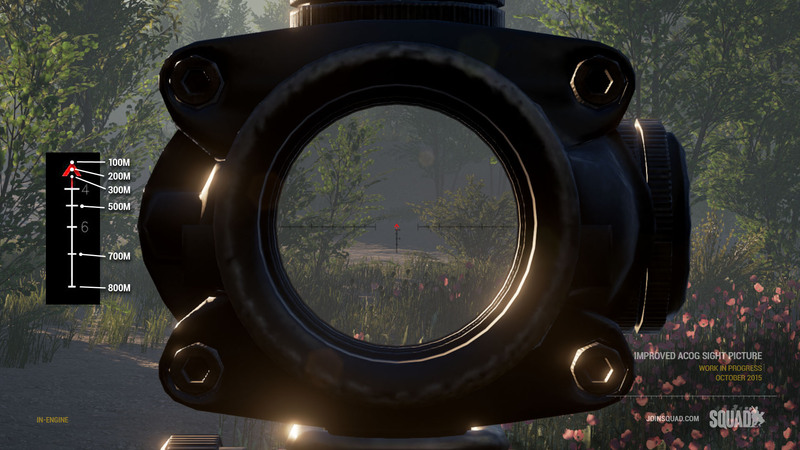 The SVD has its PSO-1 scope back. Reticle is not 1:1 with real life yet. Known Issue: There is a small jitter when viewing through the scope while standing on the edges of the map. Added an Inventory element to the HUD, showing which item you have selected and what is selected in each item group. Full recoil overhaul on all weapons. Weapon config and load out now affects the weapons recoil behavior. Slight damage and falloff tweaks on existing and new weapons. Fixed a bug where weapons would have no bullet drop under 500 meters. When entering ADS mode your sights now stay aligned. 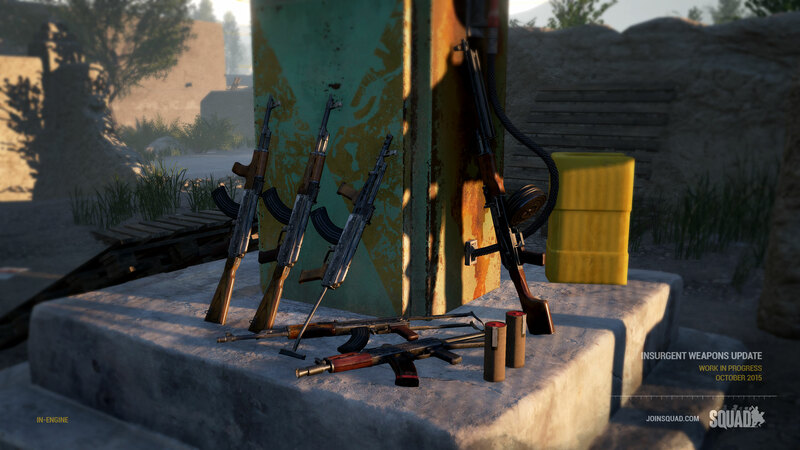 Added 5 new AK variants to playable kits: AKM, AKMS, AKS-74U, AMD-65 and PM md. 63. (All with placeholder textures). M249 now has an CompM4 Aimpoint. 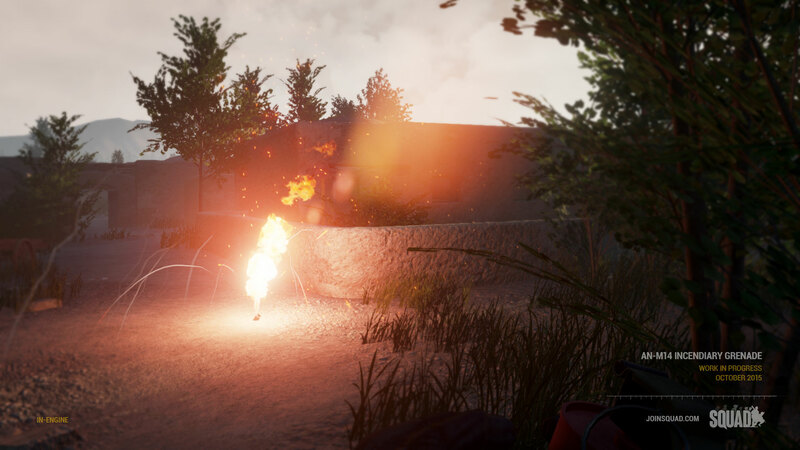 Added RDG-2 smoke grenade, replacing the M18 smoke grenade on the Insurgents. 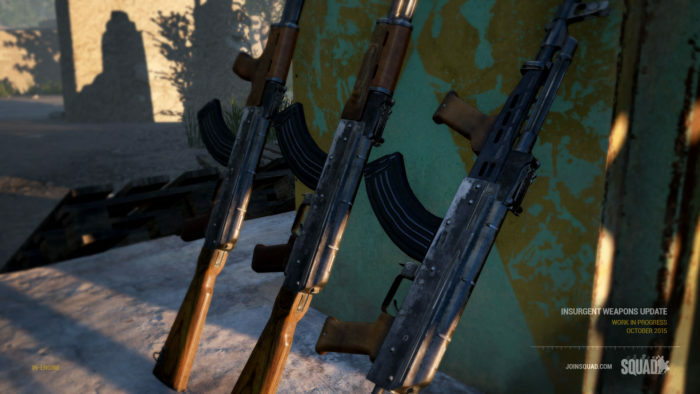 kits now have the AKM/AKMS instead of the AK-74 as standard. The AK-74 is still available as a limited kit in squads. Limited to 3. AKM or AKMS will be randomly chosen to give aesthetic diversity. They are functionally the same at this point in time. kits now have unique AKs so you can more easily identify the roles in the squad. Cell leader has PM md. 63 and the medic has AMD-65. RPG Gunner now has the AKS-74U. kit now has the Aimpoint CompM4 on his M4 again, as well as a front grip to help identify him. Grenadiers for both factions now have UGL launched smoke grenades in both white, blue and red colors. All insurgent kits now has the RDG-2 smoke grenade instead of the M18. The Rifleman ACOG kit is temporarily limited to 2 per squad. kit now has the SVD with the PSO-1, additionally he also has a set of binoculars. All kits can now resupply fragmentation grenades from an ammo crate. Still limited to one frag grenade per kit role. Server Browser now shows Map, Gamemode, and whether or not the server is out of date. Improved feedback when you are kicked from a server, or if the master server goes down. Renamed ‘Deploy Now’ to ‘Start Local’ to better describe what it does. Prevented the game from launching if certain settings were turned off, fixing ini options abuse like no shadows, no smoke particles, etc. Added “Kick from Squad” ability and “Give Squad Leader” ability for the Squad Leader, left click on the “My Squad” list on the player and follow the menu buttons. Added right click on the “My Squad” list on the player and follow the right click menu buttons. New weapon fire sound improvements for AK series, SVD and new distant fire sounds. Added injury sounds like death screams. Added more construction sounds for deployables. Added explosion debris sounds for grenades and rockets. FOB spawning is no longer disabled when 2 enemies enter the radius. Instead the respawn time scales up 15 seconds per enemy in the radius. Changed the black Dead screen to a grayscale blurred out image of the map from the map camera location. Improved spawn points so that spawns have multiple positions to check for a valid spawn. This should prevent issues where you cant spawn on an otherwise valid spawn point. Improved the Admin Observer Cams controls and features, and removed a number of hud widgets when in camera mode. Reduced the bleed out rate when incapacitated and bandaged. Shoveling a radio now adds or removes capture progress on the FOB. Stay tuned to the main website page and also the forums for the actual release of the Closed Alpha version 2, expected delivery date to be this Thursday 11pm PST/Friday 6AM GMT.